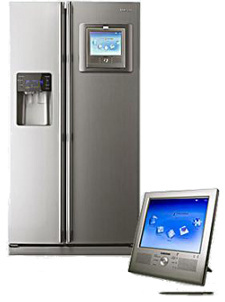 The Samsung RH269LP model refrigerator with water & ice dispenser and detachable LCD screen. Modern refrigerators have evolved way beyond the simple ice boxes of the past. Theyâ€™ve become more efficient and more convenient to use. As life at home gets more complicated, refrigerator manufacturers have come up with new features and designs to make our time in the kitchen less of a chore. Perhaps the most revolutionary was the introduction of frost free refrigerators. In the past, moisture would condense and freeze along the refrigeratorâ€™s evaporator and food compartments. Over time, the frost would build up into large chunks of ice that the owner would routinely have to scrape off. Frost free refrigerators have a heating mechanism that will briefly heat up the sections that develop frost so that it no longer sticks. Becoming more commonplace are water and ice dispensers for refrigerator doors. These are a great way to improve the quality of water that you drink, since most water dispensing refrigerators come with built-in water filters. Not only will this save you the trouble of refilling water pitchers, but it will also save you energy costs from less frequent door openings. Whatâ€™s helped even more in energy conservation is Energy Star, a program designed to maximize the energy efficiency of electrical appliances and to establishing communication between manufactures and consumers. Refrigerator companies that participate in Energy Star are given EnergyGuide labels to place on every appliance which keep consumers informed of its energy use and cost to operate. They can then use that information to compare with different models to choose the best refrigerator for their homeâ€™s needs. The kitchen will feel less drab and more fab with the recent integration of LCD screens into the newest models of refrigerators. Many upcoming models of refrigerator come with an HDTV LCD screen that allows you to watch television or DVDs while you wait through those long bake times.